After a disappointing morning of visiting cramped, exorbitantly priced houses in the Trinity Bellwood's area, we were eager for some respite and reminders as to why we were looking in that area. I called up my cousin who knows the restaurants all over downtown like the back of her hand. It's easy when you eat 98% of your meals out :^D. Jealous! Anyhoo, I said I felt like 'good' pizza or thai. Given where we were she instantly thought Terroni's. We'd eaten at the one on Adelaide and loved it so I assumed the same experience and quality. I was wrong. Well, the experience was lovely. The big tables inside during lunch were not all full yet so we had the option between inside or patio. There were lots of families inside trying to feed their toddlers what looked like awesome fresh pasta. Almost changed my mind about pizza. Wish I had. We had choice of sunny cozy tables on their exceptionally large patio. The staff were very kind in helping us arrange the stroller and choosing a comfortable table. T is big enough now that he can either sit in a high chair or prop himself up next to dad in a regular chair. Pizza is easy to share food so he got his own chair. The service was great. Everyone was very friendly. The only hiccup was at the very start when it seemed no one was going to take our order. After that, the visits were regular. 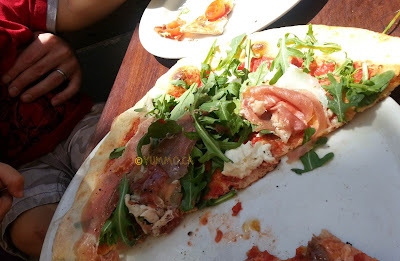 My cousin and I both ordered a special Pizza Campagnolo, a Roasted Vegetables and D got the pizza Santo Stefano with Arugula, Procuitto and Fresh Bufalo cheese. As I said, we'd had pizzas and mains at the Adelaide location before and loved the food. The quality was not the same here. The crust was thin, which we normally love but it was bland, a tad ashy, and EXTREMELY soggy. You couldn't lift the pizza if you wanted to. It was completely soaked through and floppy. D didn't think there was enough Bufalo Mozza on his. 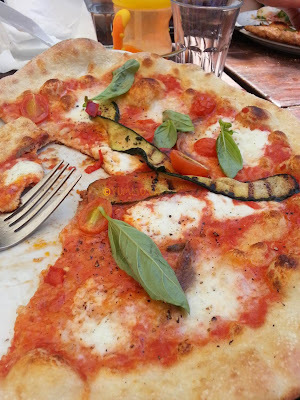 If I'm craving pizza gain in the Trinity Bellwood's area, I will look elsewhere nextime. Maybe go back to Libretto's, too bad there's always a line, yummo! Family Friendly: Seating and staff, yes, but I don't recall change tables in the two tiny powder room style toilets. Food: SOGGY pizza... just no getting over that when you were craving good pizza!